I’ve been busy, lots of butterfly chasing, some ups, some downs, love, laughter and tears. My small one celebrated her 4th Birthday in June and she is doing so well, the daily progress is beautiful to watch and according to our paediatrician, we are exceeding expectations. We will happily continue to exceed them, thank you very much! We are still very much on the Anat Baniel Method path, and we have regular visits from a very lovely local Emmett Technique practitioner too which really helps to relieve T*’s muscle spasticity. We are very happy with this combination of assistance and we are looking forward to adding a lot more horse-riding into the mix once sitting-up has reached a certain point. I have taken the plunge today and enrolled on The Bach Centre’s Level 1 Distance Learning Programme. I’m not sure yet if it is for personal development or if I may go all the way to practitioner level, but I’m looking forward to finding out! Well, it’s been exactly a year to the day since I last blogged. I have been mostly muddling, trying to work out where ‘North’ was on my compass. But I *think* I’m back, more-or-less. I’m working on changing gear, taking the pressure off and just enjoying. The great news is that T* is doing very well, she is slowly but steadily progressing in all aspects of her development, every day we see something new and she is growing into a very bright, sweet and sociable little girl. Last weekend we attended the Natural Mamas Big Camp , our first family holiday, and she took it all in her stride. We are very much looking forward to the Just So Festival in Cheshire in a fortnight, we will only be there on Saturday so fingers crossed the weather is good! Thats it for now, hopefully I will get back into blogging soon! Once upon a time, I was foolish enough to say aloud “I’m finding this hard”. The really disappointing thing was the reply I got was “well children are hard work”. As if it’s the same thing! So I didn’t say it again. I kept my mouth firmly closed because I realised that most people have no direct experience with special needs, even some of those working with SN infants don’t really know what its like to live it, not really. So I don’t tell people that its hard, not unless they ask. And depending on how much I think they are interested will depend on what I tell them. For those who are honestly seeking an insight I’ll tell them it’s the hardest thing I ever thought I would do…but also the easiest and most joyful thing because I completely adore my little girl. I’ll say its painful and fearful and hugely demanding as well as amazing and rewarding and magical. I might tell them I have cried many more happy tears that I ever did tears of frustration or uncertainty. I’ll say we are positive and celebrate every tiny achievement as each victory is a victory for all of our hard work…just the same as any negative or throw-away ignorant comment cuts so deep, a slap in the face of all the sheer amount of effort we put in. I say we thank our lucky stars that things are the way they are as life could be so much harder. Wow, can’t believe another couple of weeks have passed rapidly by! I have been very busy with felting and some other projects starting to fill up the pipeline so I’m happy. I’m trying to find an hour a day to get on with stuff without little helpful hands. The weather has been uncharacteristically lovely this past week, Spring has really crept up on me but we have been making the most of it, windows open, washing on the line, ponies have their rugs off so enjoying the sun on their backs. My small one has even been outside in her walker much to her joy. She stood at the field gate shouting “Hiya” at the ponies to get them to come over….I thought my heart would burst. In just over 3 weeks we will be thinking about packing for our next trip to London for the next set of Anat Baniel Method sessions. T* is continuing to progress well, I even remarked to our physio that her spine is much straighter now and she agreed. I requested that her legs were checked for stiffness from using the walker but thankfully all is fine, something I attribute to the fact we carry and wear T* in a sling and once again the physio agreed. T*’s neck and head strength have improved so much I have just acquired a wrap and tentatively begun learning to back wrap so there will be photos to follow soon. And another fortnight has disappeared! I have completed all current customs drawings (except for a friends) so looking forward to not getting all stressed out with finding time to draw. I’d like to do some equine inspired artwork at some point too. I’d like to share a photo of something I have recently completed, its my first needle felted picture and its of a fox and moon. It took longer than I would have liked as I had little hands trying to ‘help’. I really enjoyed having a go at this, I think its safe to say I’m a bit of a felt addict as I’m about to have a go at wet felting too. I used merino wool tops and 100% wool felt as my background. I bought my tops from sarastexturecrafts.com, there are some beautiful colour tops available, I especially love the colour blends. 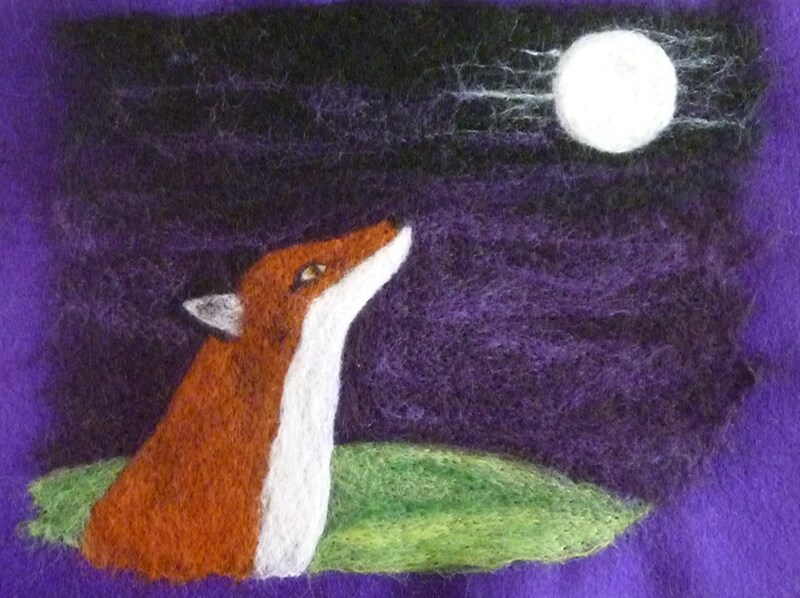 Anyway, I have submitted photo of my needle felt picture so hopefully it may be featured in Sara’s next newsletter! In other news…the small one is doing really well and we are very proud parents! 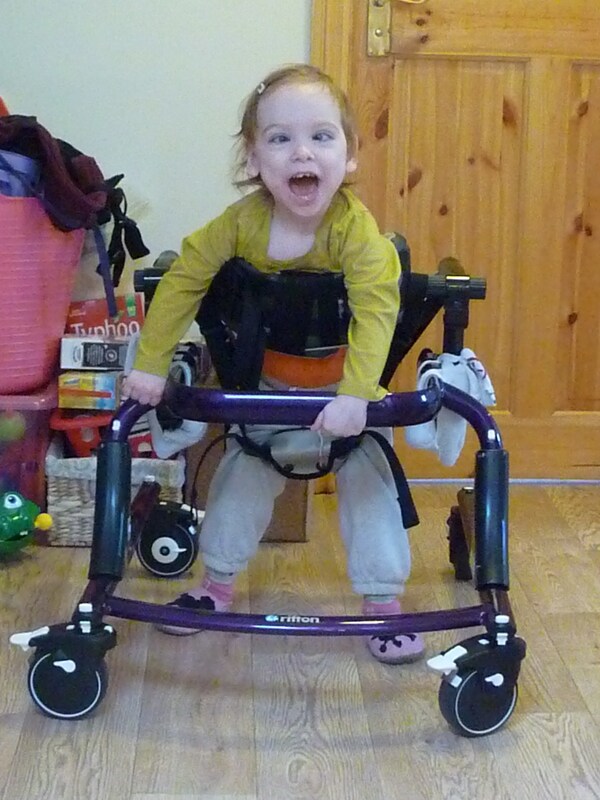 She has been getting the hang of her walker although we carefully limit how much time she spends in it. This past week she has been starting to speak much to our joy and surprise. Yesterday we visited a private pool where she suddenly demonstrated that she wanted to swim. We are really pleased with T*’s progress and looking forward to further ABM next month. Well its been about a month since I last posted and there’s been lots going on! The small one is coming along really well, she is active, vocal, becoming more independent and confident. Yesterday we had a combined physio/speech therapist visit and she managed some fantastic sitting with relaxed legs and brilliant head control. The changes we have seen in the past month are so positive. After what seems like a very long time of excruciatingly slow progress it’s very exciting for us to be moving less slowly! We plan to return to London for more ABM in late April so lots to look forward to. We are also very happy to share with you that T*’s Rifton Pacer walker was delivered yesterday, much to our surprise as all we knew was that funding had been approved, but we didn’t know if there was sufficient funding left in this financial year or that it had been ordered. To see our little one take her first steps without our physical help was brilliant, its going to take a bit of getting used to for her to be down so low when she has spent the vast proportion of her life in my arms. Initial excitement aside, we need to be careful with the walker as it could undo all our good progress and even be detrimental. So it looks as if babywearing is going to remain a vital feature in our daily lives for quite some time!